Charlotte was born on November 20, 2016 as one of the last litter of nine piglets that Pumpkin had before we rescued them together. We almost didn’t didn’t get Charlotte. At the time, we lived in a condo on the second floor and technically weren’t supposed to have any pets, let alone two pigs. But, we wanted Pumpkin to be able to keep one of her babies with her for life. So, we asked and the breeder at first told us we could have one of the boys. So, we named our future piglet Charlie after the abolitionist Charles Sumner. When we found out that we were getting a little girl piglet, we thought changing her name to Charlotte worked perfectly because Charlotte was the name of the famed spider who fought for the abolition of the abuse of pigs. 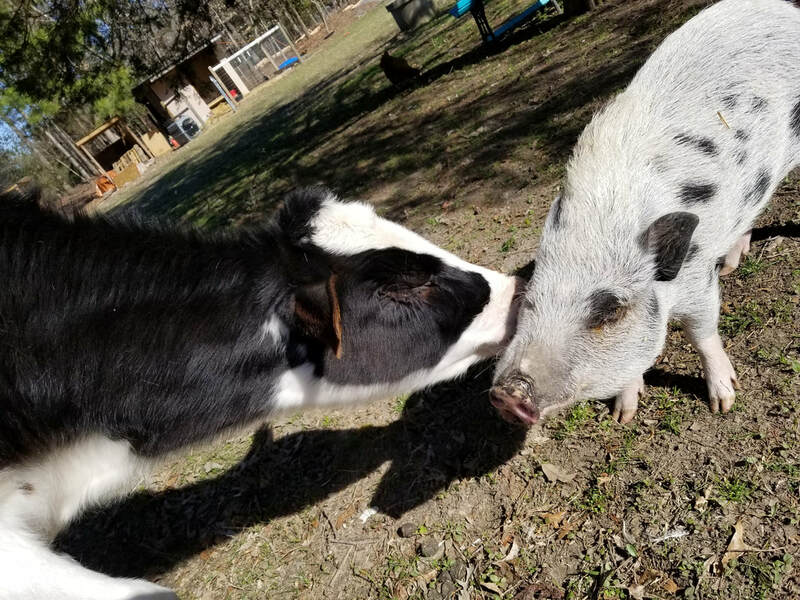 Charlotte won over our hearts and the hearts of thousands of people she met as we took her to Colonial Williamsburg, dozens of college campuses, and even to lead a parade to ban meat in Berkeley, CA. Later, Charlotte was invited by Allison Argo to tour with her documentary The Last Pig to show people that happy pigs no more want to die to be made into meat than do miserable pigs. ​But the best part of Charlotte is that she is our baby. She loves to cuddle on the couch. She still thinks she can fit in her dad’s lap and will go to great lengths to be with her family. And every night she snuggles on the couch with her mom Pumpkin and adopted sister Millie.